This cause map deals with the home foreclosure problem of 2008 and 2009. The problem or primary effect is shown on the left in red. Color is not necessary in cause mapping, but it is helpful to highlight the main problem. You read this chart from left to right and add the words "was caused by" at each line. For example, "Too many home foreclosures" was caused by "Job loss" and "Insufficient income to pay mortgage." If you need to add additional notes, you can use a line with a circle and place text at the end of the line. This is shown above. 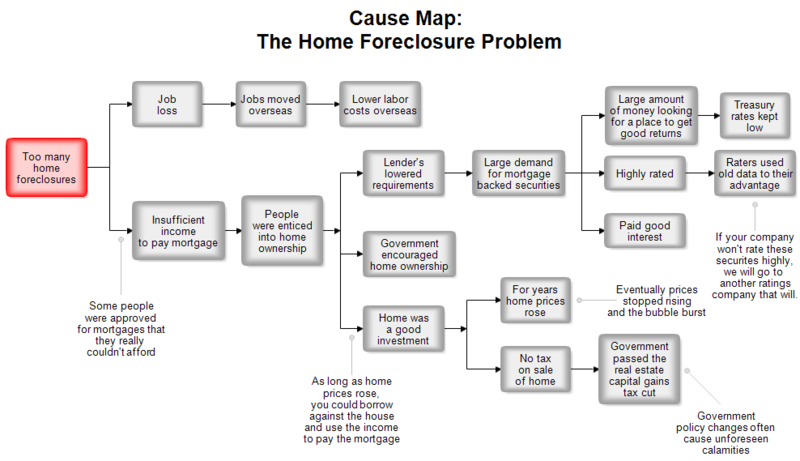 There is much debate about what actually caused the home foreclosure problem of the early 21st century, so this cause map may not be correct. The goal of this Web page is to show a sample cause map and not to solve the home foreclosure problem. Once RFFlow is installed, you can open the above chart in RFFlow by clicking on cause-map-1.flo. From there you can change the text to reflect your problem. It is often easier to modify an existing chart than to draw it from scratch.